Passing your driving test is a life changing experience. Heather Curry has experience of teaching a variety of age ranges and has a particularly high success rate with nervous pupils and those that have perhaps faced the DSA on several occasions, but haven’t quite achieved that magical ‘pass’ on the form. She believes in tailoring training towards the individuals own requirements and treats each pupil as an individual. Likewise she is very supportive of pupils practicing with their families and friends and is happy to provide support for the theory and hazard perception test. Lessons are provided in a new Ford Fiesta. 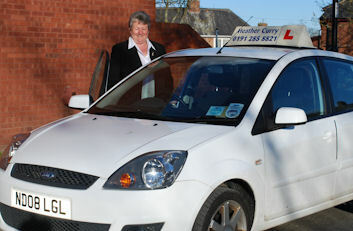 An ideal car for learner drivers.